When I think of Paris, I think Eiffel Tower and Champs Elysees. I had been to both before this trip, but never walked the entire length of this famous street. That was top of my list for this time. Starting at the Place de la Concorde, we walked right to the Arc de Triomphe. It’s a bit less than 2 miles, but with Son keen to explore and go off the beaten track and lots of diversions it took us quite a while. That was all part of the fun. I read somewhere heavy traffic, pollution and crowds could make this a bit of an unpleasant walk and the metro was a better idea. I’m glad we disregarded this advice. It was lovely. Granted the traffic is extremely busy, but the sidewalks are sprawling and there is so much to see along the way. We barely noticed the cars. Added bonus was that the Arc de Triomphe actually looks super impressive from the other end of the Champs Elysees. We found a park-like, tree-lined area with plenty of park benches to perch on. Son played in the leaves and we collected stacks of conkers from underneath the horse-chestnut trees. Along this street they have all the shops a girl could ask for. With a male dominated household though, shopping was not on our agenda and I had to make do with peeking in the windows. Husband was seriously impressed with the huge number of car showrooms and flashy vehicles – right up his street. There are lots of cafes, trendy bars and restaurants full of people on the leafy terraces drinking cafe au lait and watching the world go by. We found Laduree, its 19th century interior is fabulous and the macaroons on display in the window are gorgeous. We just salivated from the sidewalk though, we didn’t go inside. I was also excited to look into the foyer of the Lido. I said the Arc de Triomphe is impressive from a distance, it’s not too shabby close up either. 163 feet high, 147 feet wide and built by Napoleon to commemorate his army’s victories, it has become over the years the focal point for state funerals. During World War II the invading Germans and the Liberation of Paris Parade both passed underneath it. History galore here, it blows your mind. 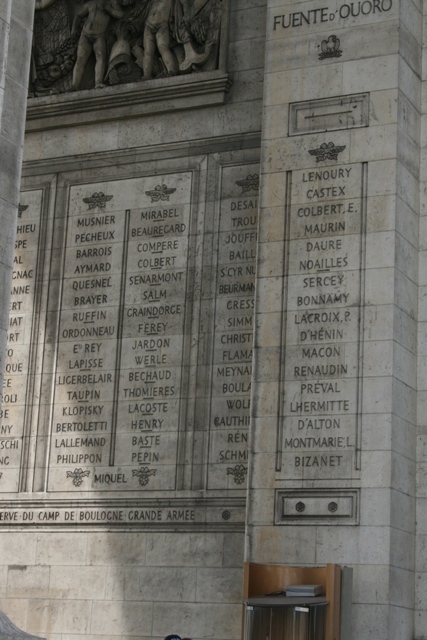 Around the top they have engraved names of major victories during the Napoleonic Period. There were so many tourists in this area, top that with crowds of street vendors and you get an idea of how hectic it was. We wandered around the base of the arc, toyed with the idea of going to the top – the views must be amazing – but with a three year old who had already walked 2 miles decided against it. Dragging him up the last 50 or so steps to the very top would probably be no fun for him (or us) was the consensus. 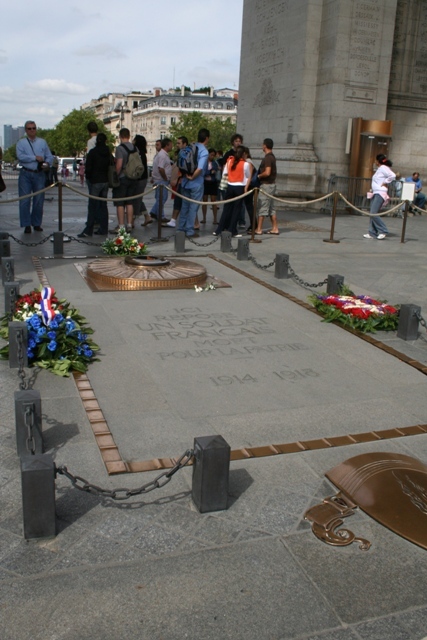 The Tomb of the Unknown Soldier underneath the arc is very special. The eternal flame commemorates the dead of 2 World Wars and on 11 November each year, France’s National Remembrance Service is held here. On 14 July, Bastille Day, a military parade down the Champs Elysees also begins here. Despite the crowds, around the tomb there was a hushed and respectful silence. 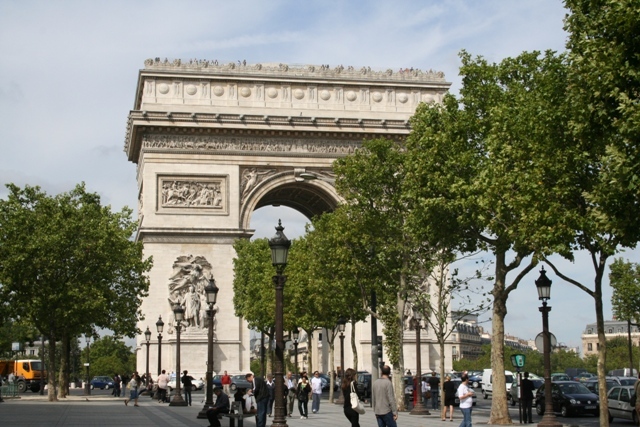 The Arc de Triomphe stands on a traffic roundabout called the Etoile – the world’s largest roundabout. It never ceases to amaze me how people drive in Paris and especially here. Standing on the Etoile and watching blew my mind. How does anyone ever negotiate this roundabout in one piece? The cars are like fairground dodgems, going everywhere, beeping and narrowly avoiding crashing and it is just constant chaos. The traffic is mesmerising, but you do also get a fabulous view with all the avenues fanning around. The Etoile is the meeting point of 12 avenues, many of which are named after illustrious generals. You get to see them all from the Etoile. So, I am glad we ignored our guide book advice and strolled the whole way down Europe’s grandest boulevard. There is so much to see we would have been short changed had we taken the metro. It does sound like a good walk – as it was originally intended. I do know what you mean about knowing when to say when with the walking if you’ve got a 3yo in tow, though! Yes, you’ve got to carefully suss out when enough is enough! Super described. Yes, metro is much better, quiet and has a much more space. What beautiful weather! When we visited Paris (admittedly just for Disneyland, we only had one day, zoës second birthday), it rained and was sooo cold! And it was June! Glad you had a beautiful day to stroll and see the landmarks! It’s a bit like the UK, hit and miss – we were really lucky on this trip, bright sunshine every day it really makes all the difference! Yes, I love it there! Oh, and that roundabout is terrifying; went round it in a taxi once. Not something I want to be doing ever again! I agree – bad enough in a taxi, imagine trying to get round it with you behind the wheel!! Stuff of (my) nightmares! Can’t wait, we will be there in July – didn’t even make it to the Arc de Triomphe on our last visit must take the kids this time around! 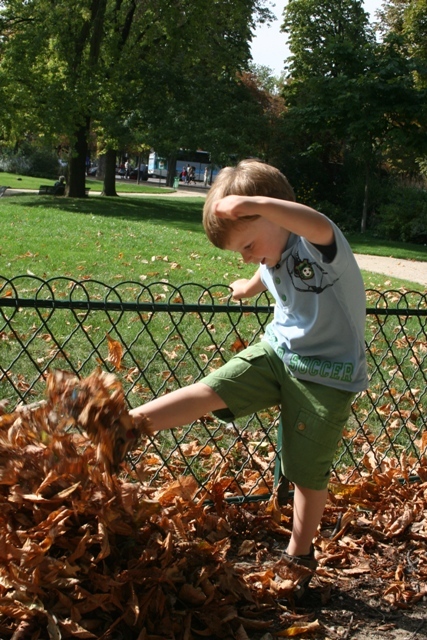 It’s a lovely (easy) stroll for kids, loads to see and do and July in Paris – I’m jealous!! Yes, I love this walk – what a fantastic place to have an apartment too! The Arc is beautiful and I found it to be so impressive in person. Loved the views from the top, especially the crazy traffic below. We were in Paris for only three nights about three years ago, your post has made me want to go back! Would have loved to see the mad traffic from up top like you did though – maybe next time!